When you think of a custom home in Colorado’s Front Range, think G.J. Gardner Homes. G.J. Gardner has been successfully building custom homes for twenty-five years. They are attuned to the Colorado buyer as an individual, in fact that philosophy is the foundation of G.J. Gardner’s entire business. With over 25,000 homes worth of experience, you can rest assured that G.J. 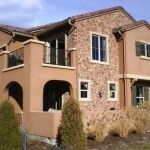 Gardner is “up to the job” for your Denver, Colorado Springs and Castle Rock custom home. G.J. Gardner Homes: Combining international vision with local custom building expertise, right here in Colorado. Because G.J. Gardner is an international company, they are able to purchase materials at superior pricing, decreasing costs to the home buyer. Another differentiation between this company and other national builders is the fact that along with a global presence, your builder is a registered local building contractor, already very familiar with your area. Local building experience is a very big deal in Colorado. This is no place for amateurs for a host of reasons. That’s why working with G.J. Gardner Homes as your builder is truly having the total package: international insight combined with local custom home expertise. Every home that G.J. Gardner builds is a custom home. They listen carefully to your concept, dreams and needs. Asking questions about the lifestyle you envision, they partner with you. G.J. Gardner then designs and constructs that perfect Colorado home that now only exists in your mind’s eye. Let G.J. Gardner help make that dream into a reality. G.J Gardner offers their five star performance warranty to provide the buyer with five opportunities during construction to inspect the home with the construction manager. The process helps to ensure your total satisfaction. This program, combined with exceptional quality has earned the company recognition within the industry and more importantly, a growing customer base. Here’s the icing on the cake: market conditions offer opportunity to those willing to act. Great pricing is available on available land and custom home sites in Colorado Springs, Metro Denver and Castle Rock. Put these low prices and near record low interest rates to work before they are a thing of the past.